In this transitional stage, the walker will face two distinct parts. The first part, a little more than 20 kilometres during which the pilgrim will pass through moorland plain and encounter slight slopes, to reach centres of genuine Maragata origin. Land of carriers and merchants, from unknown regions, strongly unique, this area boasts characteristic architecture and exquisite gastronomy, such as the famous and rich cocido maragato (A local dish of mixed pork cuts, served with cabbage and potatoes). Its enclaves have a number of catering establishments although it is still worth taking provisions of food and water to face areas scarce in fountains and shade. 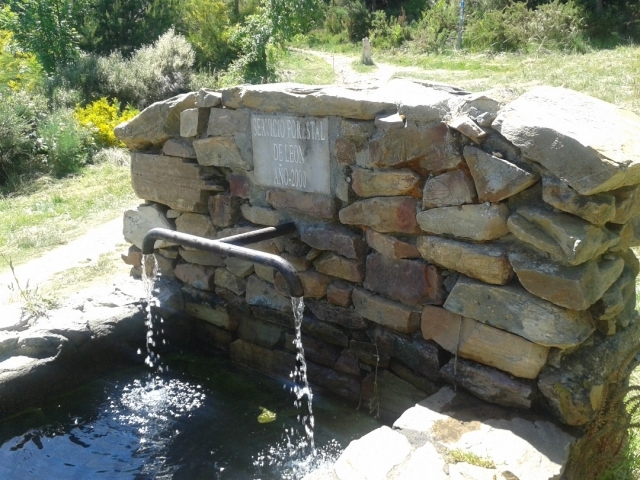 A beautiful centre with all kinds of facilities emerges in the form of Rabanal del Camino, a possible overnight alternative, if adverse weather conditions make the climb to Foncebadón unadvisable; this is an area with a very harsh climate. Walkers can begin with strength the climb to the mountains of Leon, a natural barrier between the region of León and El Bierzo. In this stage of the journey, walkers face the sudden ascent from 280 meters altitude up to 1,430 meters, a climb, however, which is not too demanding for the walker. In the first part of the stage the pilgrims may opt for a small variant that begins in Murias of Rechivaldo along asphalt and which leads to Castrillo de Polvazares a quintessential enclave of this province. It is a well cared for village of great charm, to visit will add an extra kilometre to the journey. For those arriving with strength, this alternative recommended. After breakfast in which it will be almost impossible to deny yourself from trying any of the local speciality pastries that characterize Astorga (260 kilometres to Santiago), the walker slowly moves away from this attractive stage that enters the Maragata district to then, bit by bit approach the mountains of León. The route begins from the street of San Pedro. After traveling for less than half a kilometre, the pilgrim crosses the N-VI via a pedestrian crossing to approach the LE-142, a dual carriageway with a certain amount of traffic that leads to Castrillo de Polvazares. On the pavement or on a path parallel to the asphalt walkers begin the march and pass two crosses. The one on the right is wooden with a Jacobean scallop shell, the other on the left evokes catholic pilgrims (those that connect the meaning of the pilgrimage to an inner journey to find their Christian vocation) a constant reminder throughout the French Way. After passing in front of a nursing home the municipality of Valdeviejas is reached. The centre is accessed by a sign posted, right turn from the road. If the walker continues from this junction they will reach this small town, with a local albergue and washing facilities, in the fifteenth century it had a hospital for pilgrims. However, the main route does not deviate here and continues straight ahead. Shortly after, and following a slight downhill slope, the pilgrims leaves on the left hand side the chapel of Ecce Homo, a temple from the Middle Ages remodelled in the XVIII century, and where the pilgrims can purchase and stamp the credential. This beautiful church once had a well that helped pilgrims to quench their thirst. Legend recalls how a woman on her way to Santiago stopped to take water from the well in doing so she had the misfortune of her son fell inside. Invoking the mother to the chapel of Ecce Homo, the waters began to rise, saving the young boy. According to popular memory this story inspired the inscription preserved in the chapel: "Echa limosna viajero a este Santo Ecce Homo, y al instante versa como sales del atolladero" “Make a donation traveller to this Saint Ecce Homo, and instantly you will find a solution to your suffering”. The trail leaves behind the shrine and continues along an elevated footbridge to cross the A-6, the motorway of the Northwest, which from this stage until reaching Galicia will accompany the pilgrim. Then, and along a fairly narrow path signalled by a cross, on the right along the asphalt in the direction of Murias de Rechivaldo (22.4 kilometres to Foncebadón). But before reaching this centre the pilgrims still face three consecutive crossroads with the LE-142 and must cross the river Jerga. The walker then reaches, nearly four kilometres later, this pretty but petit maragata hamlet with services. In the enclave visitors can still appreciate the construction of old drovers and houses constructed using large masonry stones with large doorways, in its day a necessity to store horse carriages. In this hamlet the parish church of San Esteban stands out with its distinctive steeple, as in other towns in the area, it has an external staircase, and the image of San Roque, the highly respected pilgrim inside. The route crosses the town by the street that runs through it on the left, and here the pilgrims will find taverns and a major private hostel. With Murias behind them, they are reunited with parallel path that continues down the right side of the asphalt on flat terrain. During the journey the pilgrims have the view of Castrillo de Polvazares to their right (19.3 kilometres to Foncebadón), a great example of local architecture, with its cobbled streets and emblazoned houses, an enclave declared of historic-artistic importance. Although the original layout of the pilgrimage route does not pass through this town directly, its beauty makes it well worth taking a short detour of little more than 1 km. To arrive here pilgrims should continue from Murias on the LE-142 for just under four kilometres. On the visit they can also try the famous, local dish cocido maragato. A well sign posted track allows travellers to link back to the ancient road near Santa Catalina de Somoza. The main route, however, does not go through Castrillo. The Camino continues on the path parallel to the road. With the silhouette of Mount Teleno visible on the horizon, the climb begins for the walker, which in these first few kilometres is fairly easy with ascents that go almost un-noticed. In fact, until the next stop there is only a small change of 100 meters in altitude. Escorted by low mountains, vegetation and some solitary trees, the pilgrim crosses the junction with LE-142 and passes a recreational area without a fountain and outdoor benches, without shade. The Camino then curiously divides into three possible routes. To the left is the road, in the centre the white gravel path for pilgrims continues and to the right there is a red dirt track. The deviation to the right leads to Santa Catalina de Somoza (17.3 kilometres to Foncebadón), a small enclave of Jacobean past. In fact, and despite no longer retaining the remains of the hospital of Virgin de las Candelas, is has been documented as a historic enclave of hospitality to pilgrims. The route reaches the grounds of the parish church of Santa María and crosses the enclave along the Calle Real, where there are two hostels and several bars. For those in need the hostels have vending machines selling bandages and other first aid items. On leaving the village the Camino returns to the path, parallel to the road. From here there are four kilometres without shade or fountains along which the pilgrims, now on a slight ascent, will encounter only a few outdoor benches and a cross of important dimensions in memory of a pilgrim who died in 2011. After covering a small section on the same road the route enters a deviation to the right to Ganso (13.1 kilometres to Foncebadón), an enclave that in the XII century had a hospital for pilgrims and a monastery. In the centre some traditional thatched houses have been conserved, known as teitadas, very similar to pallozas (small, round, stone houses with a thatched roof), the church is dedicated to Santiago and inside visitors can see a statue of the apostle dressed as a pilgrim, XVI century. The pilgrim path crosses the centre, passing the bar and picnic area La Barraca, another establishment of curious cowboy decor (appropriately named, Mesón Cowboy), turn left, past the temple and a fountain of drinking water (at the entrance there two more fountains but the standard of the water is not guaranteed) at the same exiting the enclave after passing the only hostel in the town. Just at the exit the earthy path parallel to the road is resumed which advances without any real difficulties; it crosses a junction with a local road and successive stretches below electric lines. This section is noteworthy for the company of woodland areas of oak and pine trees, which strangely fail to provide shade for suffocated pilgrims. After passing a recreation area with a cross and outdoor seating, the hikers continue to advance down a path that, on occasions is raised above the road, while in other sections the pilgrims advance on hot asphalt tracks. Gradually, the climb becomes more noticeable. From the 870 meters in Astorga, the pilgrim now reaches 1,050 meters. After leaving on the right a deviation that leads to Rabanal Viejo the path narrows and passes over the stream of Reguerinas. Less than 100 meters later it moves away from the asphalt and is heads down an earthy path with many stones and ascends after a number of successive curves between oak trees. Cyclists should continue on the road to avoid the difficulties faced by this route, which, either way re-joins the other after a climb on asphalt. The walker moves along a fence adorned with dozens of wooden crosses, constructed and deposited in place by the thousands of pilgrims who have passed it by. This is a custom on the whole pilgrimage route. After a climb and, more than half a kilometre of crosses later, the fence disappears and the path narrows again to continue parallel to the road. On the left is the well known Roble del peregrine (Oak tree of pilgrims), a majestic ancient tree that provides a generous amount of shade below it there are two benches and it is situated at the very foot of the ancient route. The walker faces a small stretch on asphalt and returns later to the parallel path. Leaving on the left the chapel of Cristo de Vera Cruz and at the following junction, takes the path (well signposted) that leads to the right to the cobbled street of Real de Rabanal del Camino (5.9 kilometres to Foncebadón). In this pretty village, the pilgrims will find all kinds of services and given that it focuses almost entirely on the Camino for economic activity, it can be a good end to the stage for weary pilgrims or, in general, for all walkers who prefer not to deal with the harsh climate of the immediate rise to come. The cold, fog and, in winter, snow are unique to Foncebadón, a mountain town situated at 1,430 meters and where there still lies nearly 6 kilometres to reach its highest point. Rabanal del Camino, which in the Codex Calixtino was the end of the ninth stage (Raphanellus) was a prominent centre in Jacobean history because during the Middle Ages it had several hospitals and churches, founded by Templar monks, and became a meeting point for those pilgrims about to face the next climb to Monte Irago. Abundant in religious architecture, visitors can still appreciate the chapel of San José (XVIII century) inside it contains an image of Santiago Apostle. There is also the church of the Asunción (XII century), which retains its Romanesque apse that has been declared of Cultural Interest. Those who choose to continue route, pass in front of the last temple and various catering establishments to arrive on asphalt, now on the outskirts they will encounter an outdoor washing area and a fountain. From here they begin on a dirt track, adequate for pilgrims but which sometimes requires paying extra attention to where you step. Flanked by oak trees, and after a very slight rise, the path reaches a new junction with the LE-142. At this point it is recommended that cyclists continue the climb towards and continue along the road to avoid the difficult dirt path taken by walkers. They reach the road and enter a narrow path that moves away from the asphalt and leads them after a long climb of more than half a kilometre to a new crossroad with the asphalt. Hikers should cross the road and continue straight ahead on a slightly wider path that runs above it. More than 1 kilometre later the walker reaches some benches, where it is possible for pilgrims to have a rest or seek shelter before beginning again the ascent and the remaining kilometres of the stage. The climb continues, gaining ground among juniper bushes and other vegetation, providing the walkers with phenomenal views of the nearby mountains and the whole region. Despite the pilgrims facing the most difficult part of the climb, the slopes rarely exceed 6%. The path continues below the electric power lines until reaching the asphalt below. The asphalt is continued for another 400 meters until reaching the inhospitable Foncebadón, the last Maragato village settled on a hill. 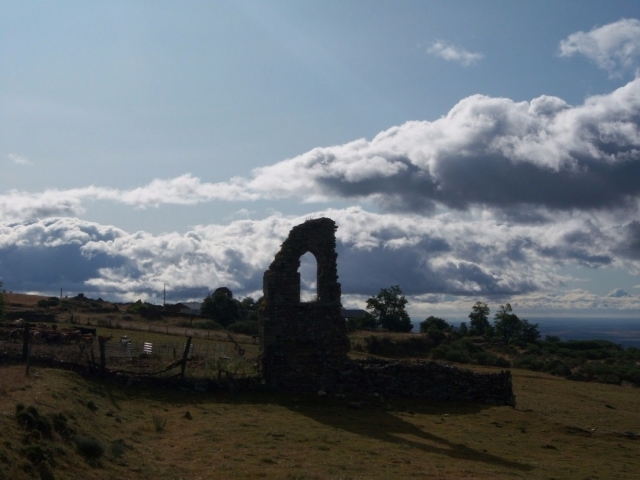 Although the village is practically deserted, it maintains the Camino in perfect condition. A wide and stony track deviates to the left and leads the exhausted pilgrims to the parish hostel. 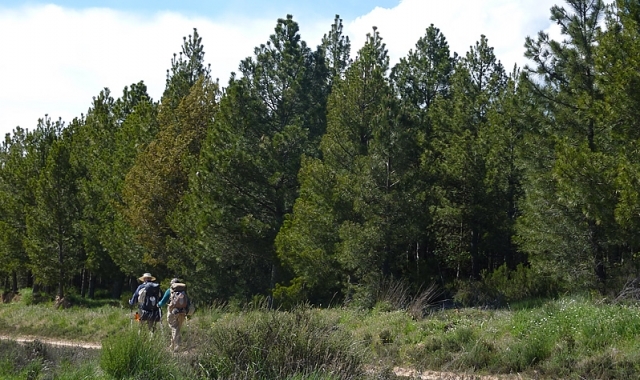 Cyclists should have no problem in completing the itinerary from Astorga to Rabanal del Camino with the exception of the climb near the stream Reguerinas, where, instead of continuing on the main pilgrim path, are recommended to continue on the road to avoid the climb on the stony path. The alternative, on the road also leads to Rabanal del Camino. In fact, those who do not require access the enclave directly can go around road and avoid its cobblestone streets. The subsequent ascent to Foncebadón can also be done on an asphalt road. The complicated path and steep climbs discourages cyclists from following the original route. By road the slope is much more forgiving. 1 reviews Distance to Santiago: 256 km. 1 reviews Distance to Santiago: 251 km. 1 reviews Distance to Santiago: 240 km.